IEC 60704-2-14:2013 specifies the measuring conditions to provide for sufficient accuracy in determining the noise emitted and comparing the results of measurements taken by different laboratories, whilst simulating as far as possible the practical use of household refrigerators, frozen-food storage cabinets and food freezers. 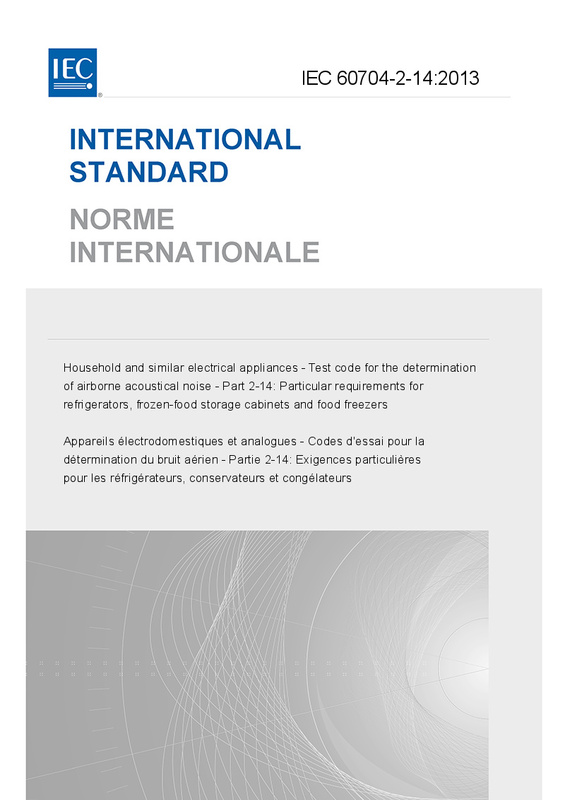 It is recommended to consider the determination of noise levels as part of a comprehensive testing procedure covering many aspects of the properties and performance of household refrigerators, frozen-food storage cabinets and food freezers. This edition includes the following significant technical changes with respect to the previous edition: a) the description of an appropriate test enclosure has been removed from this part of IEC 60704 and has been incorporated into Part 1 of IEC 60704-1; b) the values of standard deviations of sound power levels determined according to this part of IEC 60704 have been added. This publication is to be read in conjunction with IEC 60704-1:2010.